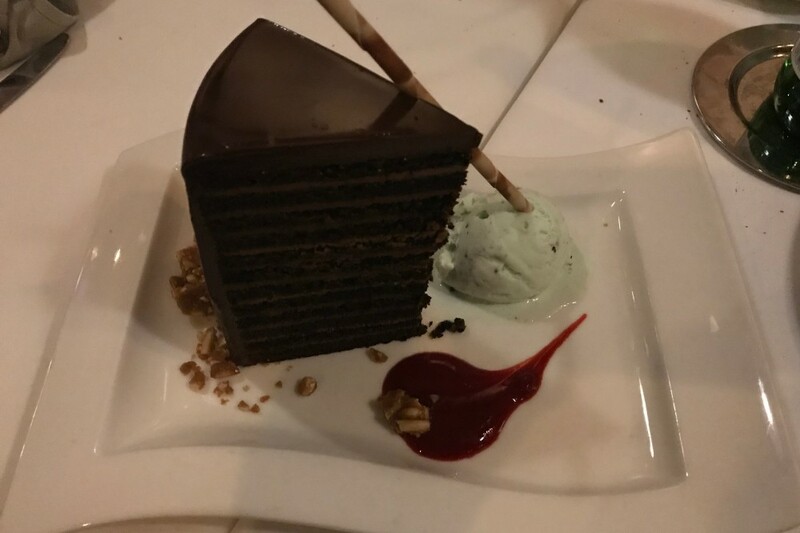 According to a server at Steakhouse 55 in the Disneyland Hotel, Friday night the restaurant served its signature 24 Layer Chocolate Cake for the final time. According to the Cast Member, desserts for iconic restaurant were being made at the Disneyland Resort’s central bakery. Starting this week, all of the desserts will now be made in-house. Chocolate Banana Tart [$12.00] – Manjari chocolate ganache, banana sponge, chocolate chantilly, candied hazelnut. The dessert menu still features a Cheese Plate [$17.00] that includes Shaft’s Blue, Cypress Grove Midnight Moon Aged Goat, Bravo Silver Mountain Cheddar, Bellweather Farms San Andreas Manchego, and Marin County Camembert.